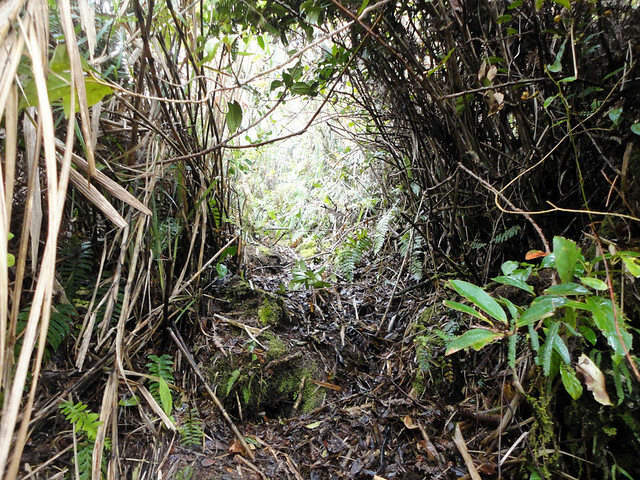 Steep descends, slippery cliff sides, and obstructing fallen trees - these were the challenges that greeted our team as we entered the ridge that connected the summits of Dulang-Dulang and Kitanglad. No one can stay too lax while dealing on these trails since almost every inch was too tough and very demanding. from time to time, Kitangald summit would appear in the horizon. 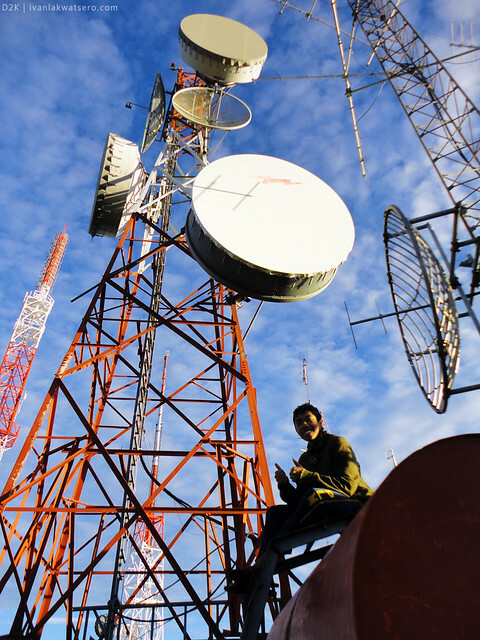 notice that the summit has communication towers. After an hour of dealing on the early parts of the ridge that was a heck of a challenge, a more bearable, straight forward trail followed. There were still a few obstacles on the path, but those are much easier to negotiate with. 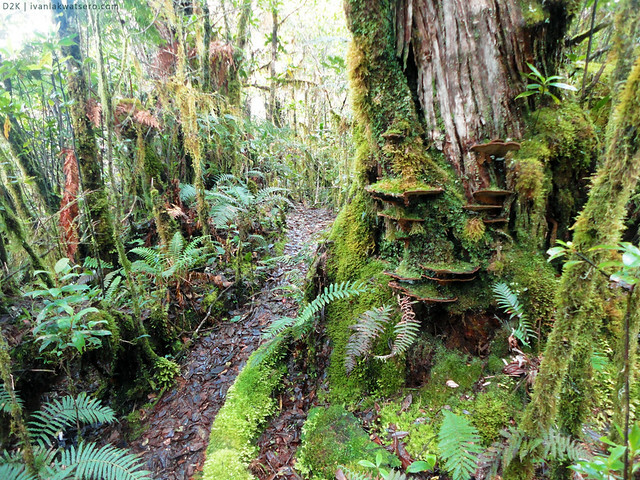 Not to mention, it is a beautiful mossy forest trail. 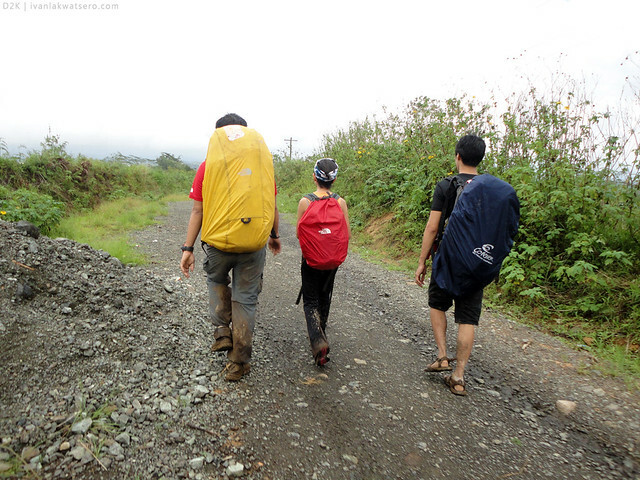 The trail was a series of ups and downs, alternating, but it was untiring. 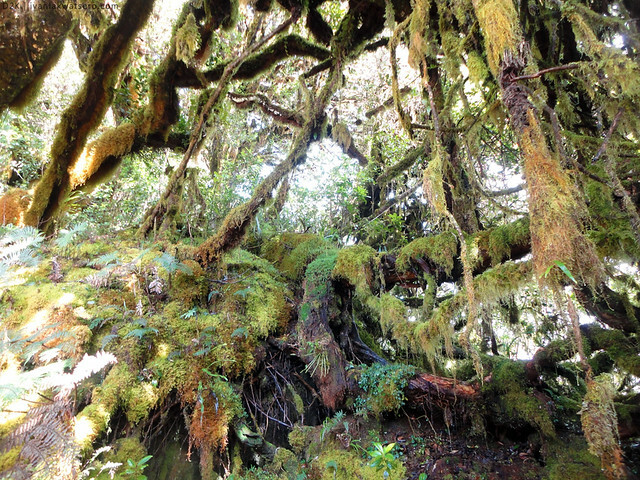 In fact, we were running on most parts of it, we would only slow down whenever we encounter a mossy slippery log on the trail. By 12:30 PM, about 3 hours since we left the summit of Mt. 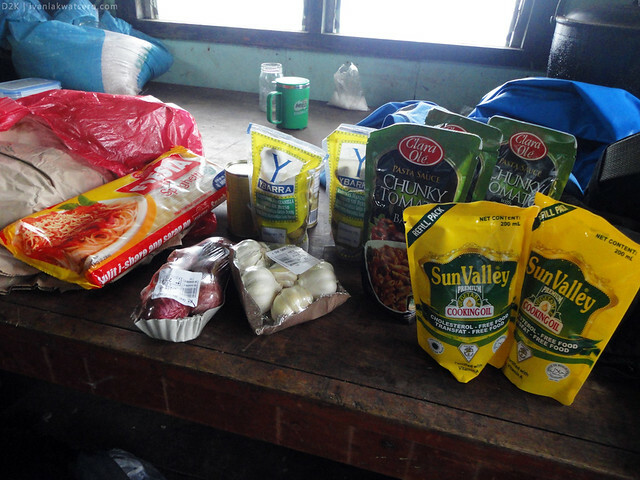 Dulang Dulang, our team decided to stop for lunch. 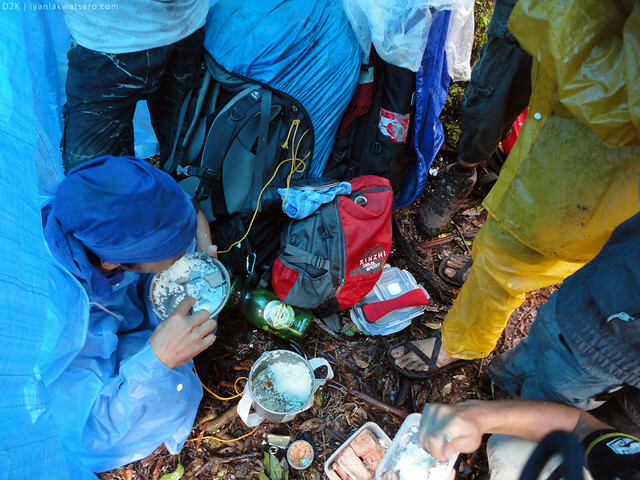 It was however a lunch under a tarpaulin since rain has started pouring again. kesa maging basang sisiw kami ulit. Kuya Bogart said we were almost halfway. 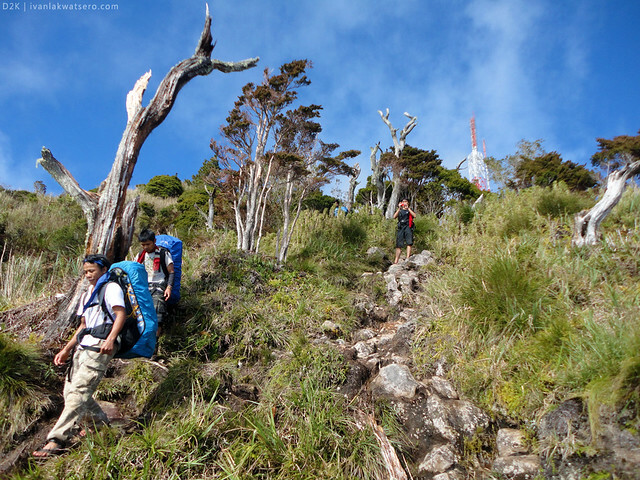 It excites us, knowing that the summit of Mt. 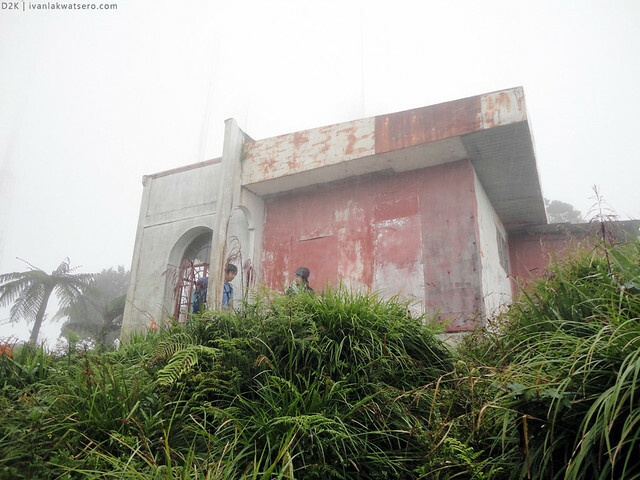 Kitanglad has bunkers where we could stay in. In times like this, where nature is putting up arms against you, shelter must be the top priority. 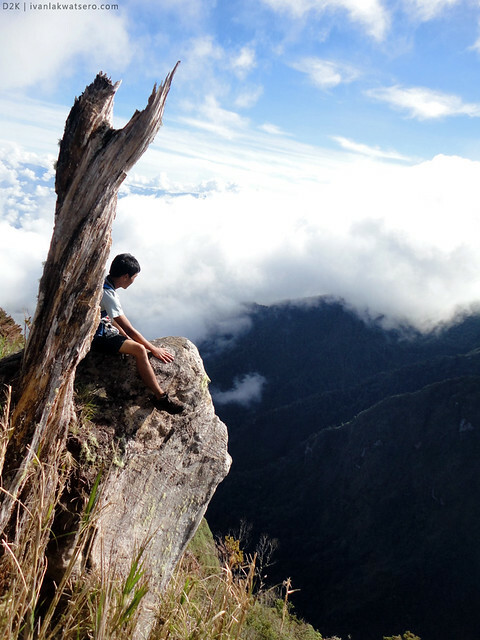 Unlike the ridge trail, the ascent to Kitanglad summit was undeniably very challenging. 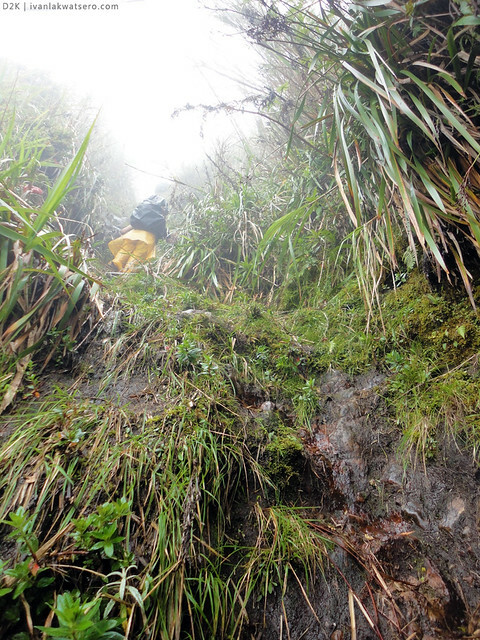 First, we had to trek up a steep and slippery trail, laden with tall blade-like grass for like an hour or so. Not only that, it was also infested by my blood-sucking friends, limatiks. And to make matters worse, it was showering by that time - mud and limatiks were intensified. For me, it was the most difficult part in the whole D2K traverse. talahib trail to Kitanglad summit. Second, there's a portion in the trail where we had to climb a 90° rock face. No ropes, no tools, just pure grips on the cracks and grooves. those with phobia in heights might faint when they see this. It's a 20 minutes ascent on this 90° wall. At some points, my knees were shaking. 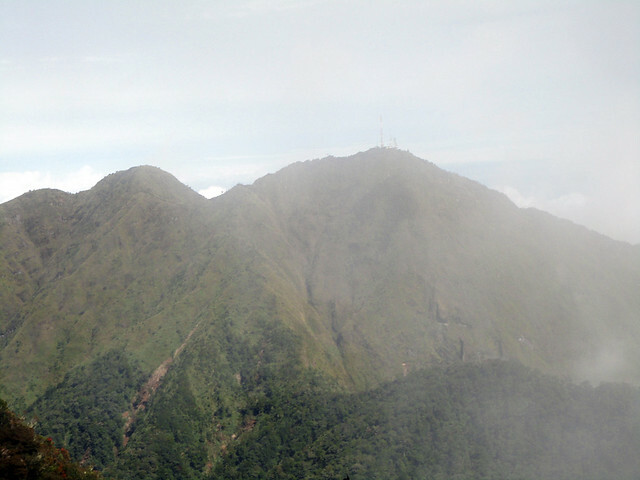 All in all, it took us almost 2.5 hours to ascend Kitanglad Peak. Elements like rain, limatik and mud tried to impede us but still we managed to reach the top, the 4th highest in the country. Great joy when the towers/establishments came out from the fog. It was only around 03:10 PM when we arrived at the summit of Mt. Kitanglad. Napaaga dahil sabi ni Kuya Bogart aabutan daw kami ng dilim kapag hindi namin binilisan. And since we ended the day's trek quite too early, more time was put to resting, chilling and doing nothing. 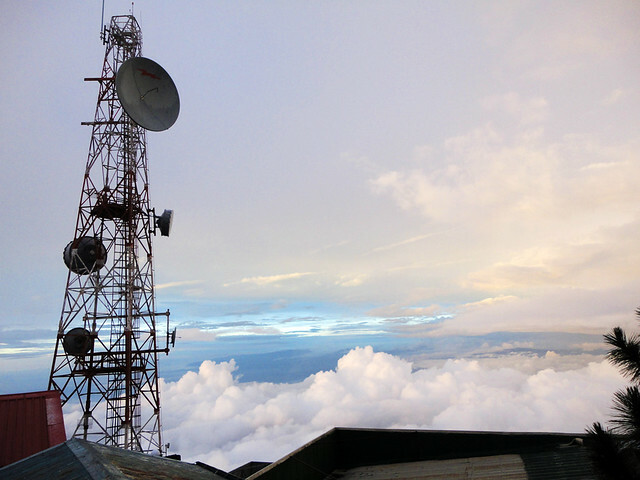 we stayed inside a bunker that houses a troop of military men who were tasked to guard the communication towers in summit. as promised, I prepared something special in this climb. Pasta Putanesca! before the day ended, we went outside to gaze upon the majestic colors of the sunset. It was clear sky the morning that followed. 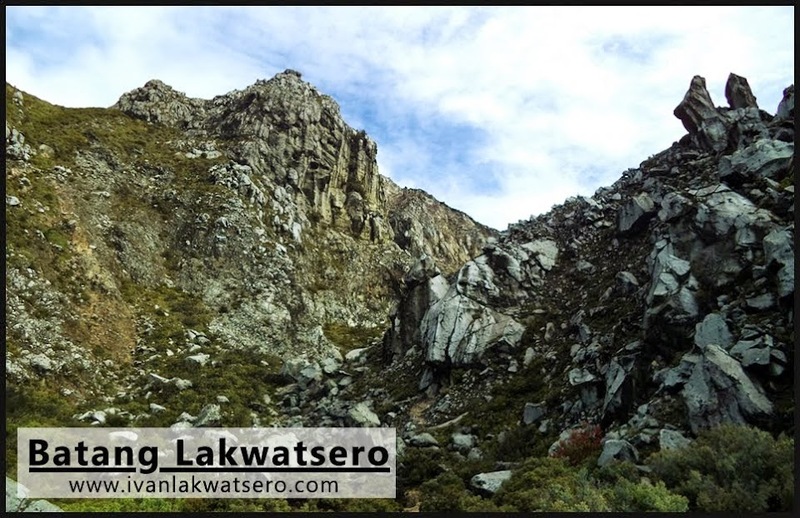 This gave us the opportunity to see and appreciate the entire geographic features surrounding Kitanglad Range. Where else should we go for sightseeing, on top of a building of course! So, like burglars, we hurriedly climbed the roof top of one of the buildings. Atop, I fed my eyes with greatness and pure beauty. perfect spot to see amazing things. 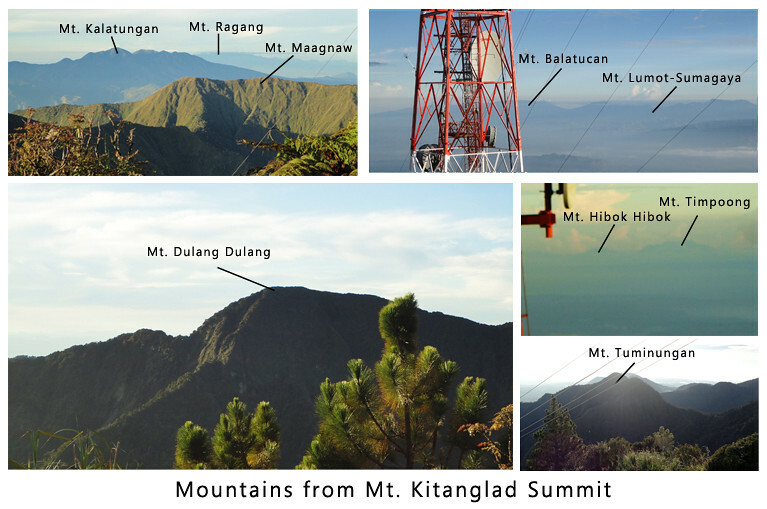 Many mountains, including some that are listed in the top 10 highest in the country, were spotted from the summit of Mt. Kitanglad. I have labeled them already in the following photos. Some of the top 10 highest mountains captured in one photo. up to this day, this photo brings smile to me. 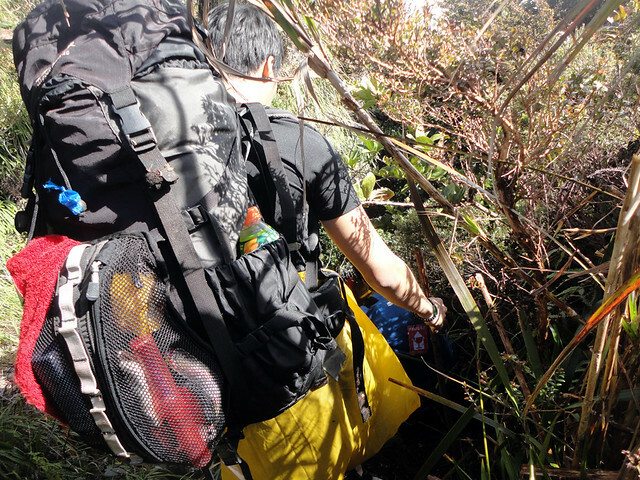 At 08:15 AM, after breakfast, we resumed trekking to the final leg of our D2K traverse. 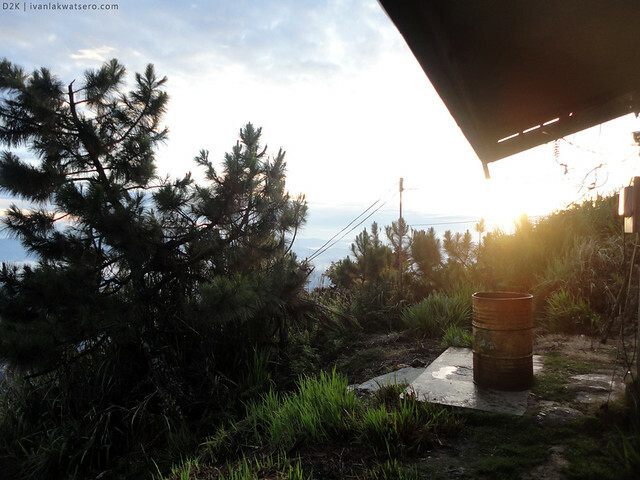 For 3 and a half hours, we took the all-descending trail to the end point of our D2K climb which is located at Sitio Intavas. Mt. Kitanglad's trail was very scenic. I can't help myself not to pose for pictures. The trail of Mt. 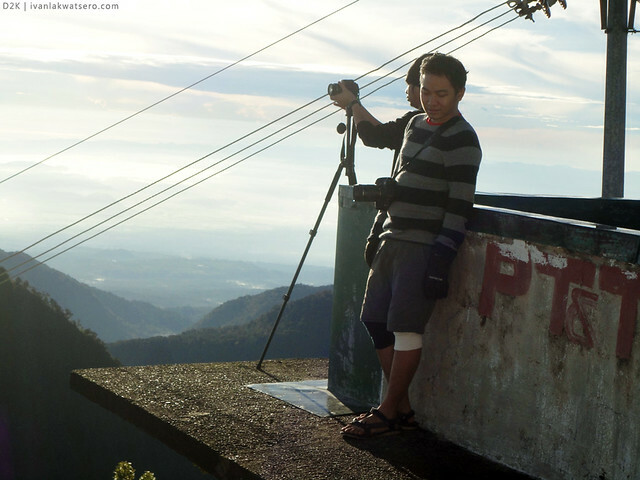 Kitanglad was pretty much similar to Mt. Apo's Kidapawan trail. It's purely descending, quite muddy and very steep. 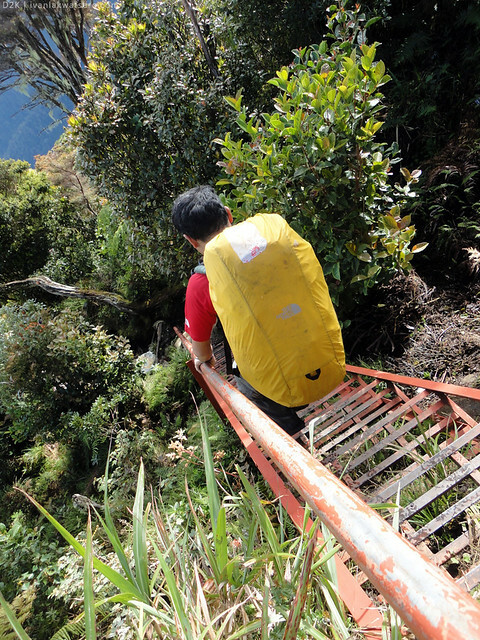 From time to time, however, there were steel stair steps that made the descent a lot easier. The steel stair steps made the descent almost effortless. Medyo shaky nga lang yung hagdan. 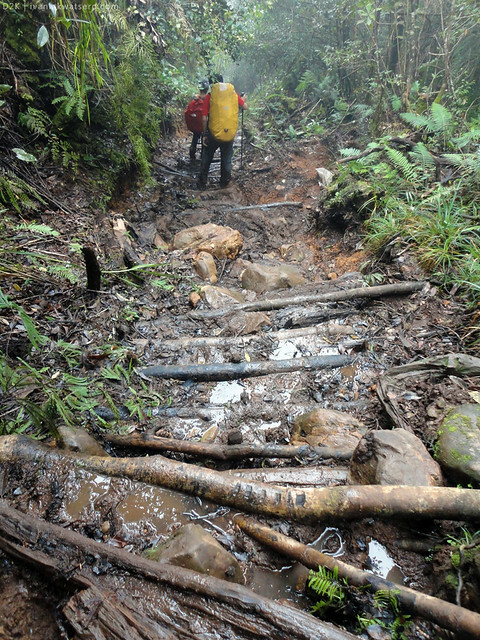 while most of the steel stair steps were still under construction, many parts of the trail have this makeshift steps made out of wood, rocks and mud. We finished our D2K climb when we reached the "Welcome to Mt. Kitanglad" marker at Sitio Intavas. But just when we thought it was all over, we realized that we still have to walk a 4.5 km dirt path to where our ride was waiting for us. It was around 01:20 PM when we finally reached civilization. Ahh, we're done with D2K traverse at last. Awesome! We traveled back to Malaybalay City as soon as we finished our D2K Traverse so that we can, again, travel to CDO right away (you know it's wise to spend our last day in Mindanao near the airport). Before we part ways, we ate lunch at Malaybalay City. I saw priceless smiles when I handed to our porters, Kuya Ayan and Kuya Garry, a printed copy of their photos during our climb which they requested. our porters, Kuya Ayan and Kuya Garry,wearing priceless smiles. Later that day, we arrived at CDO - good rest at last! may i ask for your guide's contact numbers? thanks! you may contact Sir Oyec - 09063492585, or Sir Bogart - 09058352999 to help you arrange a hike here. hello! sir updated pa ang contact number ng guide nyo? Thank you for celebrating your 21st in Mindanao... Your blog is so informative, thank you for the tips and your photos are amazing! 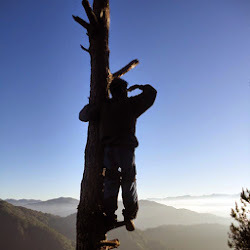 You can experience the same adventure by clicking https://outdoorislife.com/event/mt-kitanglad-dulang-dulang-major-climb/ for the upcoming hiking event.